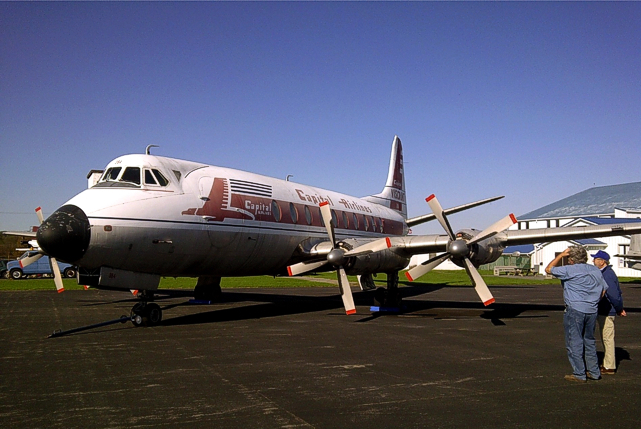 Welcome to the first 2013 Vickers Viscount Network newsletter. Let’s start with some really interesting news items. 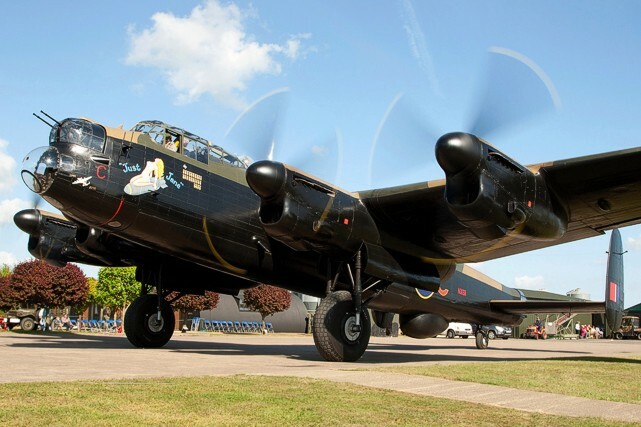 Many of us followers of aviation around the world would have seen an interesting and welcome news item that two brothers who own an Avro Lancaster, have announced plans to put the aircraft back in the air. 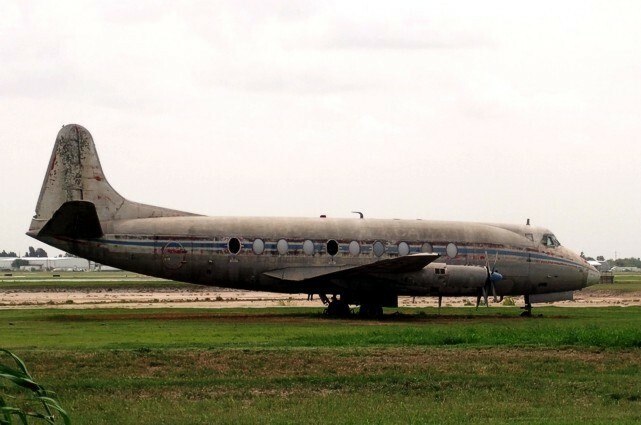 The announcement came relatively soon after it became apparent that Viscount c/n 170 9Q-COD ex G-AOHV in Africa would be a big challenge as a restoration project. 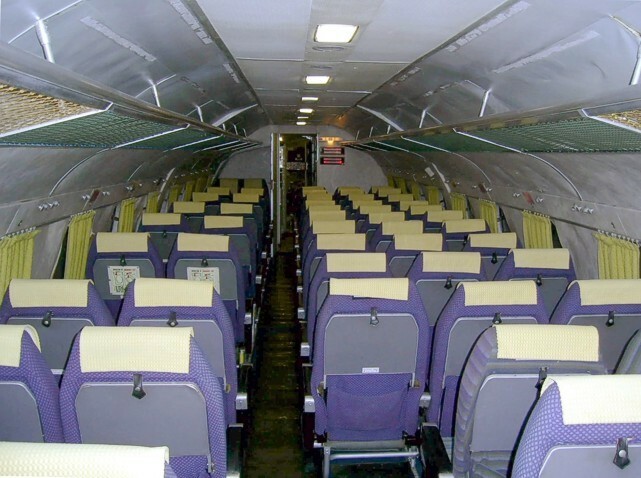 However this aircraft was the last Viscount to fly and a recent engineers report has confirmed that it is still complete thus making it a prime candidate for a 'Viscount to the air' project. "Those of us in the UK (and many other places too) may have seen the news item last night about the team in Lincolnshire who own the Avro Lancaster NX611 ‘Just Jane’. They have announced that they are intending to get it back into the air after 41 years on the ground. If they succeed, this will be only the third airworthy Lancaster in the World – two in the UK and one in Canada." "If you believe enough in something you will overcome all obstacles and make it happen. We all say that we would love to see and hear a Viscount fly again, can we make it happen? Not surprisingly this drew considerable comment and no doubt all of us would like to have a Viscount flying again. Many were supportive of the idea and as Geoff says, “nothing is impossible”. 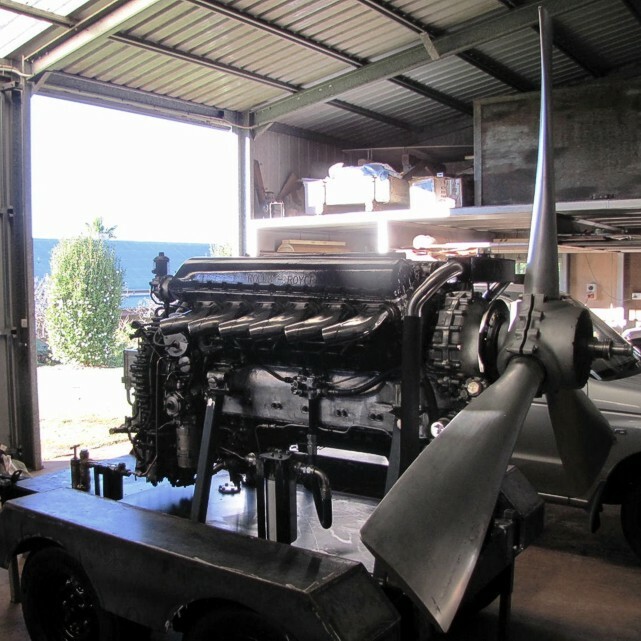 In recent times various extinct or rare aircraft types have taken to the skies, particularly so in New Zealand, including a de Havilland Mosquito, an Avro Anson Mark 1, and numerous extinct WWI aircraft now in reproduction form. Keith Nell in South Africa commented, “During the course of marketing my book ‘Viscount Down” internationally, I have both been contacted by and made contact with numerous Viscount pilots and engineers including those whose job it was to keep Viscounts flying in a country besieged with international sanctions and who planned and designed susceptibility reduction processes to protect the Viscounts against SAM-7 missiles. These gentlemen have the requisite enthusiasm and do not give up. My sixpence worth of input is to suggest that a Viscount Restoration Team is formed from these highly experienced personnel with Viscount experience who are in their senior years and available in the UK to help, as you say, in many ways. Other readers took a more cautionary approach citing that money would be one of the biggest hurdles to overcome. Other considerations included availability of parts and a suitable aircraft. Would for instance a museum be prepared to part with their Viscount or remain involved in its operation as an active aircraft? Also considered was whether a flyable aircraft would meet the requirements of the country’s aviation regulations. Would finance be available for on-going upkeep? All these points too are valid. Again, as Geoff says, "Who within our ranks has the energy, drive and personality to make it happen?" Let us have your thoughts on how we may be able to make the seemingly impossible possible. Well that caught your attention eh! To find the people with the energy, drive and personality to make a 'Viscount to the air' project work we need to spread the word. To help us do this please pass on a link to this newsletter to everyone that you know asking them to do the same. Eventually this message will land in the hands of the people who will make a project like this happen. Core members Julian Bourn and Mike Higgins have been busy preparing the 2013 Vickers Viscount Network get-together which will be held at the MAM - Midland Air Museum, Baginton, Coventry, Warwickshire, England CV3 4FR on Saturday 11th May 2013. 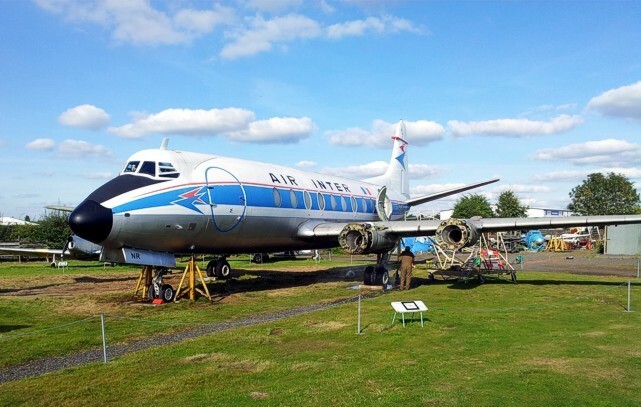 The Vickers Viscount Network and the MAM - Midland Air Museum invite everyone with an interest in the Vickers Viscount, together with their family and friends, to 'Coventry Viscount Day', a day where this famous aircraft takes centre stage. The star of the event will be V.708 Viscount c/n 35 F-BGNR that has recently been re-assembled by volunteers at MAM - Midland Air Museum and is now essentially a complete aircraft again. We are all really impressed by the work of the Viscount team at Coventry and I'm sure that we would all like to thank them for their dedication to F-BGNR and the Viscount cause. We are so pleased that we now have three complete airframes in the UK that are being looked after by dedicated teams, that will ensure their long term survival. 'Coventry Viscount Day' is great opportunity to meet fellow Vickers Viscount Network members, the MAM team, and inspect F-BGNR. This is our second get-together at Coventry, our first in 2008 was just after F-BGNR had arrived at Coventry and the Vickers Viscount Network was in it infancy. Since 2008 ownership of F-BGNR has changed but the hospitality has not and we would like to thank Mike Higgins, his Viscount team, and the MAM management, for this great opportunity. To book your places please send an email to the address below stating the names of all the people in your party. We will send you an email confirmation that will include your unique event ticket. 'Coventry Viscount Day' is FREE to everyone attending apart from the normal MAM - Midland Air Museum admission fees and lunch. 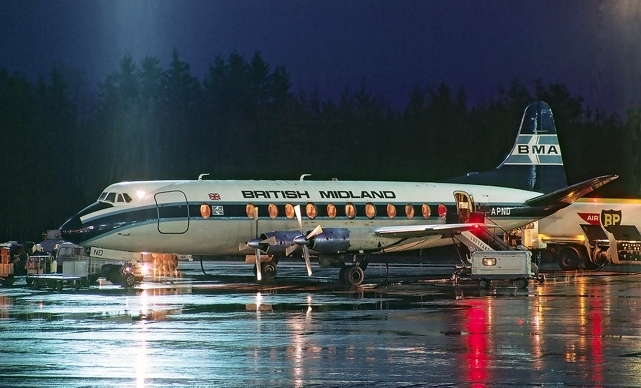 A voluntary donation to the MAM - Midland Air Museum to help with the up-keep of the Viscount will be much appreciated. 10:00 Museum opens and 'Coventry Viscount Day' visitors will be directed to the 'Robin' Hangar. 10:50 'Coventry Viscount Day' visitors will be directed to the MAM - Midland Air Museum Education Centre. 11:00 'Coventry Viscount Day' presentations begin. 11:00 - 11:05 Welcome by Vickers Viscount Network core member and events organiser Julian Bourn. 11:05 - 11:25 Barrie James - Chairman of the MAM - Midland Air Museum Board of Trustees will talk about aspects of the MAM collecting policy and how to keep a small museum fresh. 11:25 - 11:40 Julian Bourn presents the history of Viscount c/n 35 F-BGNR that started in 1954. 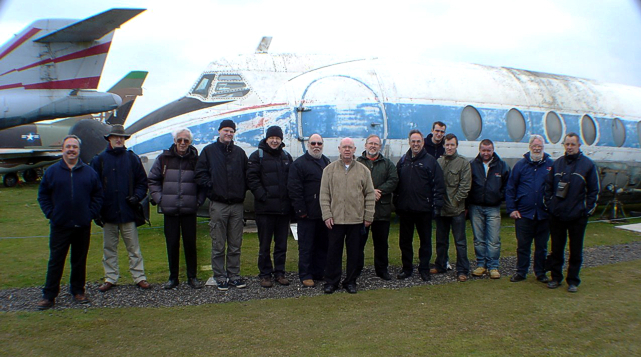 11:40 - 12:00 Malcolm Lambert tells the story of the reconstruction of F-BGNR by members of the MAM - Midland Air Museum. 12:00 - 12:15 Comfort break. 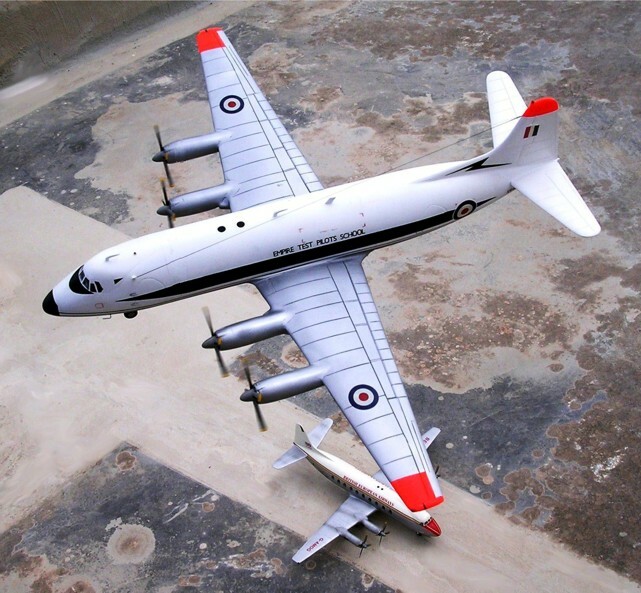 12:15 - 12:35 'We designed an aeroplane...and we called it the Viscount' (George Edwards) - a talk by Romer Adams of the Viscount Preservation Trust. 12:35 - 12:55 Romer Adams will show a Viscount sales film. 12:55 - 13:15 Retired Viscount Captain Ron MacDonald describes flying the Viscount with TCA - Trans-Canada Air Lines and Air Canada. 13:15 - 14:00 Lunch - either at the MAM - Midland Air Museum cafe or 'Coventry Viscount Day' visitors bringing their own. 14:00 - 15:00 Guided tours of Viscount c/n 35 F-BGNR by MAM - Midland Air Museum volunteers. 15:00 - 17:00 'Coventry Viscount Day' visitors are now free to visit other MAM - Midland Air Museum exhibits. Questions: - The guys from the Vickers Viscount Network and the MAM - Midland Air Museum will be happy to take questions at any time throughout the presentations. We are delighted that Romer Adams of the Viscount Preservation Trust has kindly agreed to speak on the early years of the Viscount, from the Brabazon Committee days to the sensation that the Viscount caused after the first flight in 1948 and entering service in 1953. At 'Brooklands Viscount Day' in 2011 we were able to broadcast the event live on the internet. Unfortunately, the bandwidth of the internet connection at Coventry is not sufficient for us to do this at this year's event. 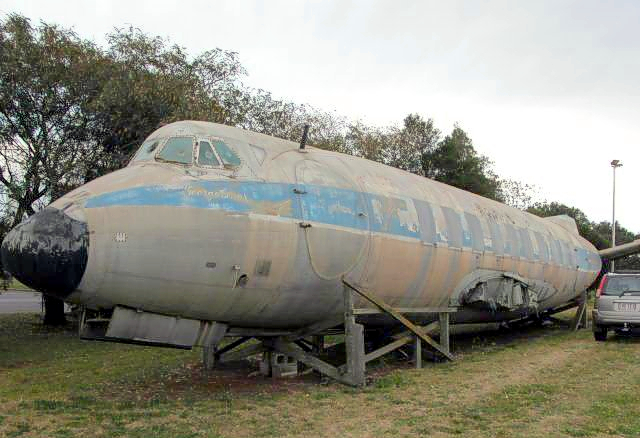 “My sister and her husband are in the process of buying V.756D Viscount c/n 197 VH-TVL currently located at Toowoomba, Queensland, Australia, and moving it to their tourist complex near Miles where they intend to restore it to somewhere near original looking condition but with fake props etc." Drawing of fuselage to enable support points for transport to be identified or suggest where a drawing could be sourced. Suggestions for transport cradle – my thoughts are to make up say 5 'U' shaped cradles and support the fuselage on adjustable slings attached to the tops of the 'U'. The cradles would be bolted/welded to 2 longitudinal stretchers to allow the entire assembly and fuselage to be lifted on to the transport vehicle. Alternatively I wonder if air bags could be used for support. “I was interested to read Alan Robert's message. All the transport information they need would still be available from any of the transport companies who have moved it before. By memory I think it was only two fuselage slings. The wings and wheels were at Toowoomba originally with Les Arthur. Without them, I’d give up any idea of displaying it as a complete aircraft, or one on wheels. I work in Air/Sea freight and the cost of importing wings would be prohibitive, assuming you could source them. Just the cost of trucking them from Brisbane to Miles would be in the region of $5,000 as there are no return loads to Brisbane for that sort of rig. Malta resident Carmel Attard has sent us photos and reviews of two very impressive Viscount models in 1:72 scale that he has constructed. The reviews are extensive but unfortunately a bit too long to include in the newsletter. However he has provided us with links to them to provide us with an insight into the construction of these fine aircraft models. UK core member and graphic artist Nick Webb reminds us that he has a very extensive range of 1:144 scale decals and also some 1:96 decals - namely: Air Rhodesia, Air Zimbabwe- Rhodesia, LAV Aeropostal, Silver City and Pluna. A full list of decals can be viewed on Nicks website. Recently Nick has designed the new Vickers Viscount Network logo. Christchurch New Zealand in September 1972.
almost certainly heading to Scott Base Antarctica. Widmarc Clark remembers, “In August of 1961 I joined the U.S. Navy. At the time I was living in Rockville, Maryland. I flew out of Washington National Airport, in Washington D.C. I was very excited when I discovered I was flying to Chicago to boot camp training on a Capital Airlines Viscount. It was a fun trip. Only a curtain was hanging in the doorway to the cockpit, so you could see the captain and the co-pilot flying the airplane. I was able to see the Rolls-Royce turbo props from the cabin window. The Capital Airlines Viscount has always been my favourite passenger plane. I have flown in a Ford Tri-motor, a Southern DC-3, an Eastern Super Connie and Eastern's Jet Prop Electra. 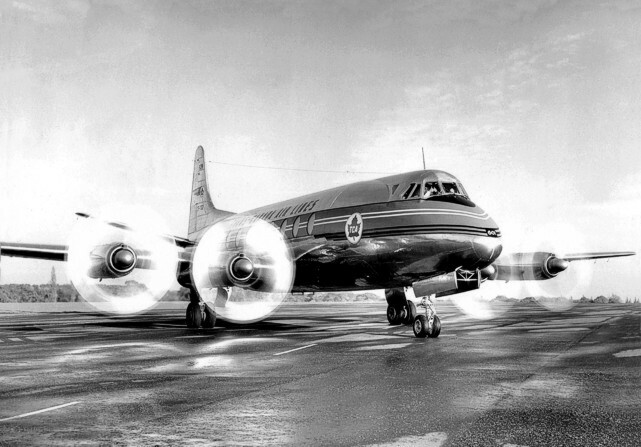 I’ve also travelled in Convair 580, Martin 440, DC-4, DC-6 and DC-7. I've flown all the various jets of the modern area. Nothing compares to the Vickers Viscount. It is a one of a kind - beautiful airplane, when it was dressed in the Capital livery it had no equal. Capital was bought out by United when they could no longer pay for their Viscounts. Gone was the beautiful paint scheme. Then later all the United Viscounts disappeared forever. Those were the days. For those who never got to fly in a Viscount, well you missed out on an airplane that was a "True Queen of the Skies”. They made a unique sound that you never forgot when they were started up. I have several models of the Viscount, the original Hawk model, and several Glenco models. All are now discontinued. I have pictures of the Viscount hung in my home, beautiful they are. America has built some fine looking passenger airplanes. 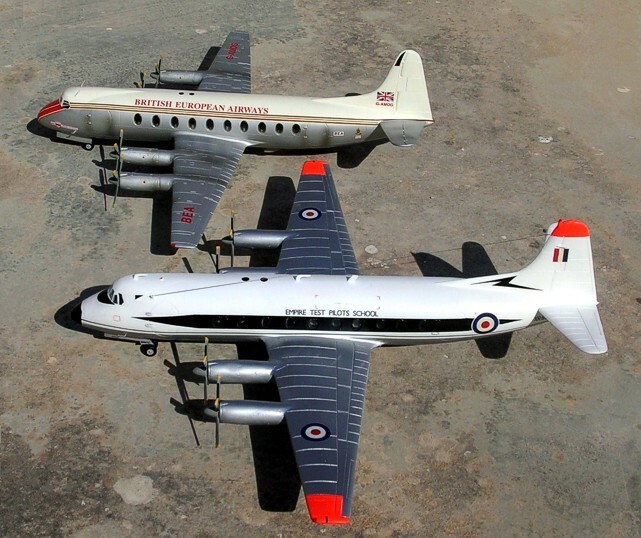 They have not built one as gorgeous as the Vickers Viscount. Although we have the “Organisations with complete Viscount airframes” link on our website, it does not mean that it is by any means complete, in fact, It would be nice if there is always just one more awaiting to be rediscovered? 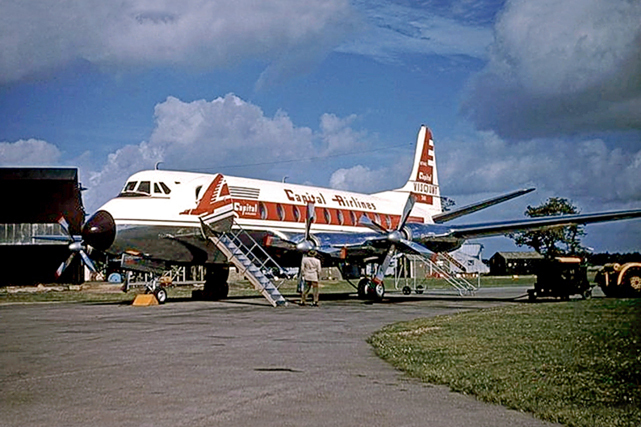 During 2012 correspondence covered the possibility that V.757 Viscount c/n 144 remains in existence. 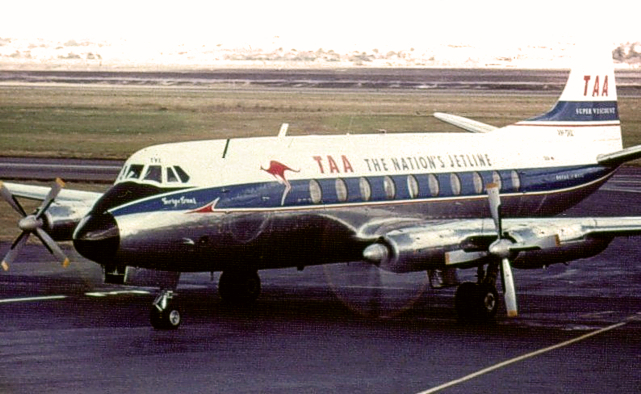 Originally built for TCA - Trans-Canada Air Lines as CF-TGZ it later served with Air Canada. In 1982 it was sold to Grupo Madero S.A. Inc. and registered N3832S. In 1995 it was sold to the Confederate Air Force that later became the Commemorative Air Force in 2002. Michael Kerston has provided us this recent photograph of the Viscount, along time resident at Brownsville, Texas. And there are more . 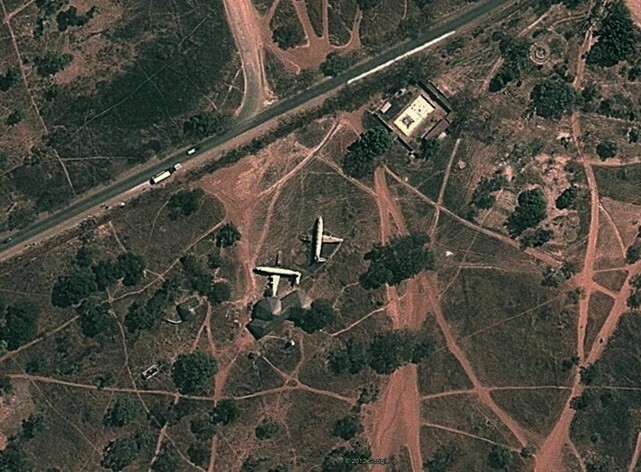 . .
“I have just read the section in the July 2012 Vickers Viscount Network newsletter about V.816 Viscount c/n 436 Z-WGB and V.838 Viscount c/n 446 Z-WGC in Chegutu, Zimbabwe. 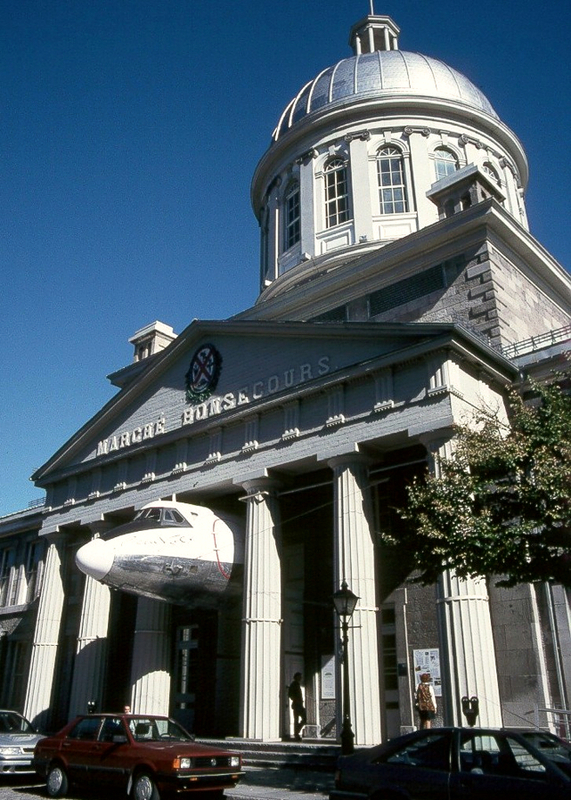 I thought you might want to know that both Viscounts still existed at the restaurant as recently as August 2011. When was the ferry flight of CF-TGI? 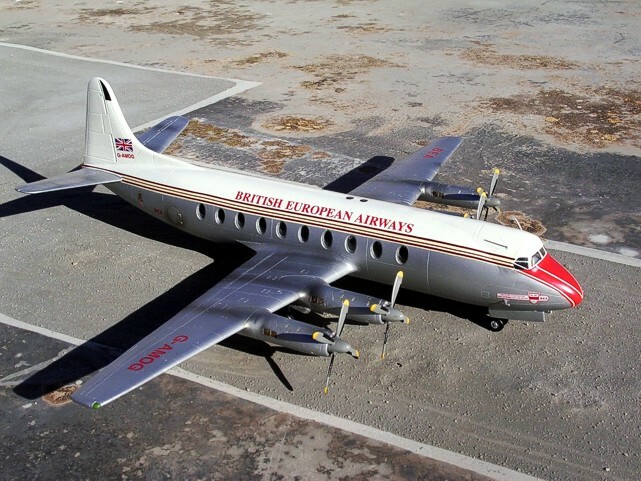 “I am having problems discovering the exact date of departure of the ferry flight of V.724 Viscount c/n 40 CF-TGI from Wisley, Surrey, England to Dorval, Montreal, Province of Quebec, Canada for TCA - Trans-Canada Air Lines in December 1954. George Lothian in his book states it was December 6 which agrees with Peter Pigott's National Treasure. However in the 'Between Ourselves' edition of January 1955, Gary Parker states it was December 8th, as does the 'Flight' article dated 17 December, 1954. Stephen Anderson in the 'Between Ourselves' edition of 1 February 1955 gives no exact date in his report (and he was on board too). Also the number on board the ferry flight varies between 10 and 12 in various publications. Bill Everitt tells us of an exciting project he has underway. He is building a Viscount simulator. 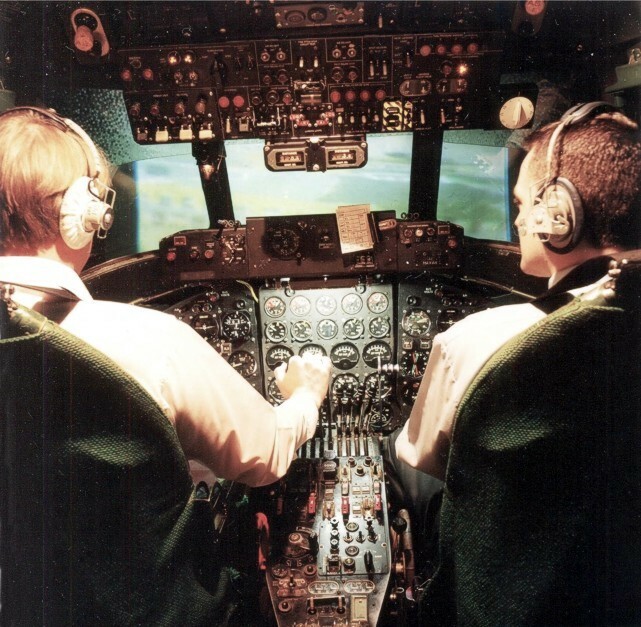 He takes up the story, “I am currently in the process of building a flight simulator based on Microsoft's FSX around salvaged parts from an original Viscount flight simulator. I have no information about the parts as all the data plate details have been erased, much the pity, however I believe that the throttle quadrant is from a V.810 Viscount and most of the main flight instrumentation i.e. the ADI and HSI is of the ‘Sperry family’. My intention is to interface the various parts mainly instrumentation, throttles and various switching etc., using standard servos, stepper motors and dc motors via 'OpenCockpits' hardware and interfacing software. The reason I am contacting you is that I require some information and hope that somebody within the Viscount community may be able to help. I am seeking some dimensions of the interior of the Viscount cockpit mainly width’s side wall to side wall from cockpit bulkhead to instrument panel and heights again from bulkhead to instrument panel, these do not need to extremely accurate but enough so that I can build a reasonable representation of the Flight deck. Also I'm looking for some close up pictures of the Captain's and First Officer's seats as I will have to build them as best I can. I also seek close up pictures of the control yoke with some dimensions, as again, I will have to build something to fit. I'm trying to build as authentic as possible. Should anybody have old parts from Viscount cockpits that they no longer need and may wish to sell or trade I will be very interested in knowing what is available. If you can help please email Bill at the address below. “Another interesting Kennedy fact is that when Jacqueline Kennedy was First Lady, she made a tour of India and Pakistan. The President of Pakistan was so impressed that just before she left India for the Pakistan part of the trip he offered her personal use of his Vickers Viscount to tour the country." 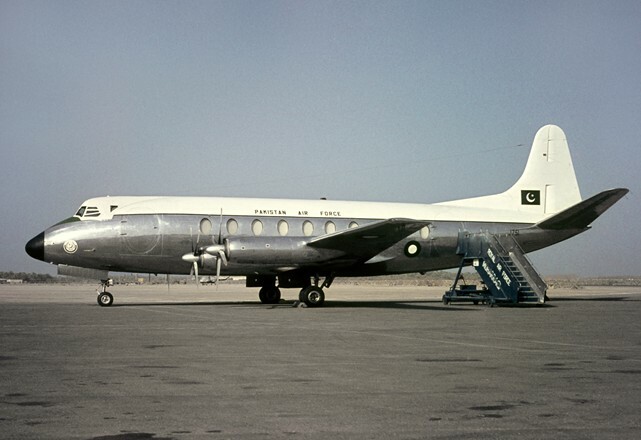 "This must have been V.734 Viscount c/n 83 J751 which was registered as a VIP transport with the Pakistan Air Force from 1956 to 1970. This aircraft was sold to CAAC - Civil Aviation Administration of China, I hadn’t realized that CAAC ever operated the V.700 series. Details of this can be read in the biography of Clint Hill, one of Jacqueline Kennedy’s security guards." Editor's note: Looking at the photo page for c/n 83, we do not appear to have any photos of this aircraft in Chinese livery when registered B-414 and later B-5114. Can anyone help? "As for Viscounts in the movies, perhaps the biggest Viscount bonanza occurred in the Norman Wisdom film 'What’s Good for the Goose.' This was a popular British comedy at the time, though probably didn’t get much attention outside of the UK." 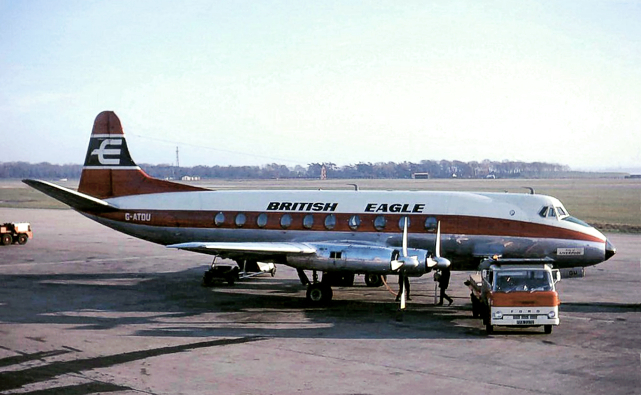 "A significant scene was filmed from the wonderful balcony of the old Liverpool Airport, featuring British Eagle and Cambrian V.700s. The film was released in 1969, but judging by the Eagle planes and the Cambrian colours I would say it was filmed at Liverpool the summer before, as British Eagle went under in November 1968. 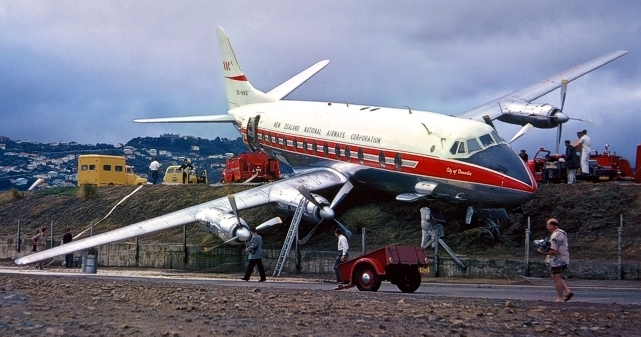 “Mention recently (between myself and newsletter editor Peter Layne) of the NAC - New Zealand National Airways accident to V.807A Viscount c/n 428 ZK-BWO when it over-ran the runway at Rongotai, Wellington, New Zealand, reminded me of something I wanted to ask the Viscount preservation technical people about." "Our version, the V.807 (Dart 6) was fitted with automatic 'ground-fine' pitch mechanism. i.e. for the props to go into GFP after landing, the throttles had to be closed, and the landing gear squat switches closed (4 amber indicating lights). It was basically this feature that contributed to the above accident, as the conditions and location, prevented this configuration from being achieved initially. Whereas, other versions of the Viscount, I believe may have/or were fitted with selectable GFP, as was the F-27 with almost the same engines and propellers. 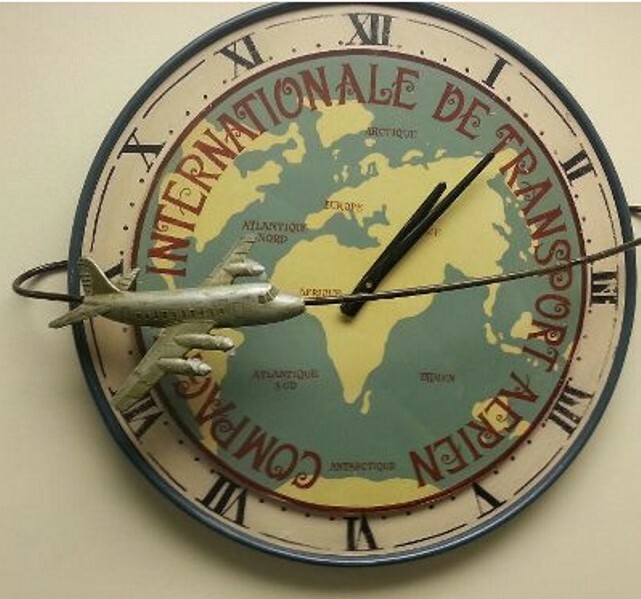 That is the question: Was GFP, manual or automatic an option when ordering the aeroplane? The reason I ask is that I spent some-time flying in Japan in 1970-71 on the F-27. An All Nippon captain told me their Viscounts had selectable GFP. Having experienced both systems I couldn't understand why anyone would want the automatic feature! To add a bit more detail to the accident, it was an almost calm day at Wellington, the runway sloped down toward the South for most of its length. The Viscount would settle into ground effect very easily, and sometimes take forever to actually touch down, especially if there was a knot or two above the TTS. The slope didn't help at all; the aeroplane would float along forever, with the wheels just kissing the ground, great for impressing tarts but eating runway like no tomorrow! That's what happened here, and it was not recognised until too late! Anyone who can answer Jim's question please do so through the usual email. Although spectacular, the damage to ZK-BWO was relatively minor and the Viscount was flown to Christchurch three days later for permanent repairs. Footnote: Jim Pavitt was First Officer on V.807 Viscount c/n 282 ZK-BRE which had carried Her Majesty, Queen Elizabeth II, on 16 February 1963 from Dunedin to Christchurch during her tour of New Zealand. He was also First Officer when ZK-BRE carried King Bhumibol and Queen Sirikit on their August 1962 visit to New Zealand. We hope that you have enjoyed this issue of our newsletter and would like to hear your view and comments on it. To provide feedback, or information and photos for inclusion in the virtual museum or our newsletters, please send them to the email address below. Photos should be scanned as a JPEG (.jpg) ideally producing an image of at least 600 KB to give us something to work from. Scanning prints at 600 DPI and slides and negatives at 1,200 DPI usually produces good results. Don't worry about the condition of your photos as we can work wonders with most images that have strange colours, dust marks, blemishes, etc. Peter Layne - Chief Editor, Wellington, New Zealand. Ed Jones - Editor, Manchester, England. Ron MacDonald - Editor, Surrey, England. Ron Rhodes - Editor, Waterloo, Ontario, Canada. Simon Ellwood - Newsletter Production, Leeds, England. 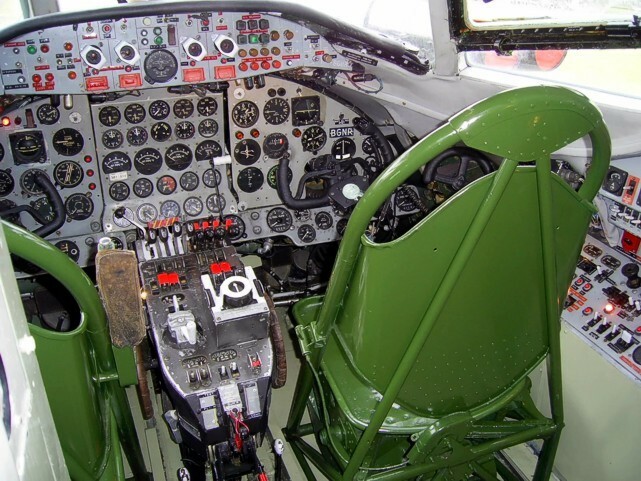 Although every endeavour is made to find an answer to questions, please appreciate that the team here at the Vickers Viscount Network are all unpaid volunteers who fit this work in with their daytime jobs and chores around home. Any opinions expressed in this publication are not necessarily those of the Vickers Viscount Network or the newsletter editors and production team.